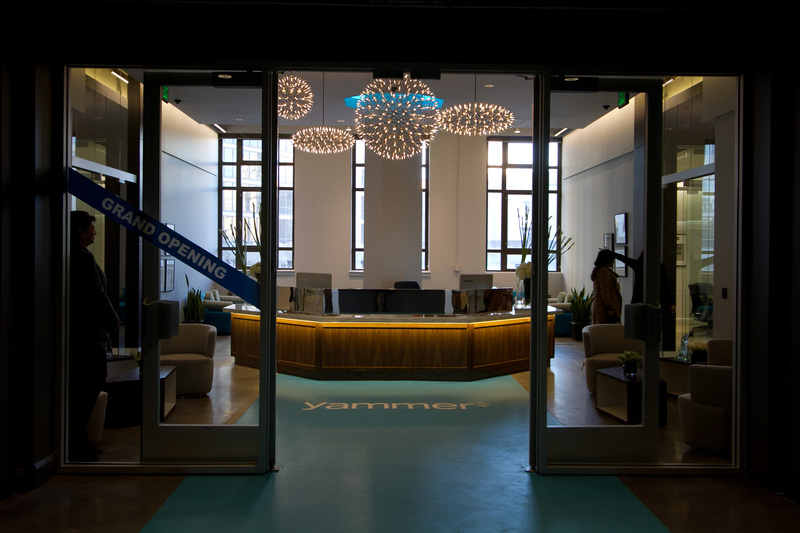 Microsoft-owned Yammer has just opened up its new headquarter office in the mid-Market district of San Francisco. Co-founders David Sacks and Adam Pisoni cut the ribbon to celebrate the new office space. With the move, the company joins other tech giants making the area home to their employees, including ZenDesk, Twitter, and One Kings Lane. 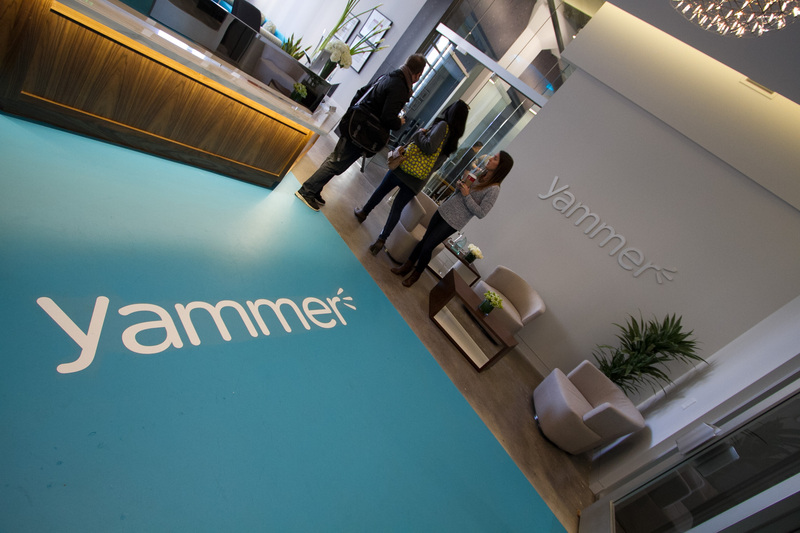 Previously located near the CalTrain station at 410 Townsend Street, Yammer had rapidly outgrown its space. By the end of the year, it inhabited at least two floors and lacked the necessary conference room space for its teams to be productive. 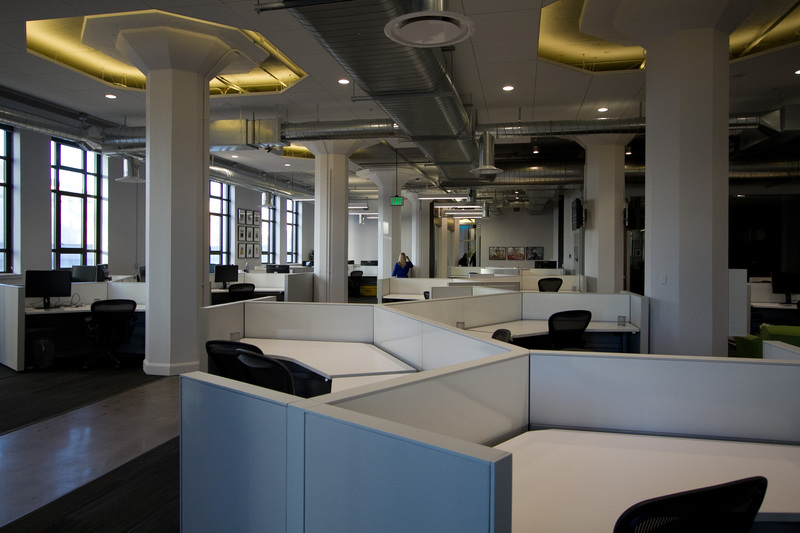 Today, Yammer is inhabiting a space encompassing 80,000 square feet and enough room for at least 400+ desks. Its San Francisco office has 330 employees right now, with 445 stationed globally, including its New York City office, which Yammer opened last summer, and in London. The reception area at Yammer. 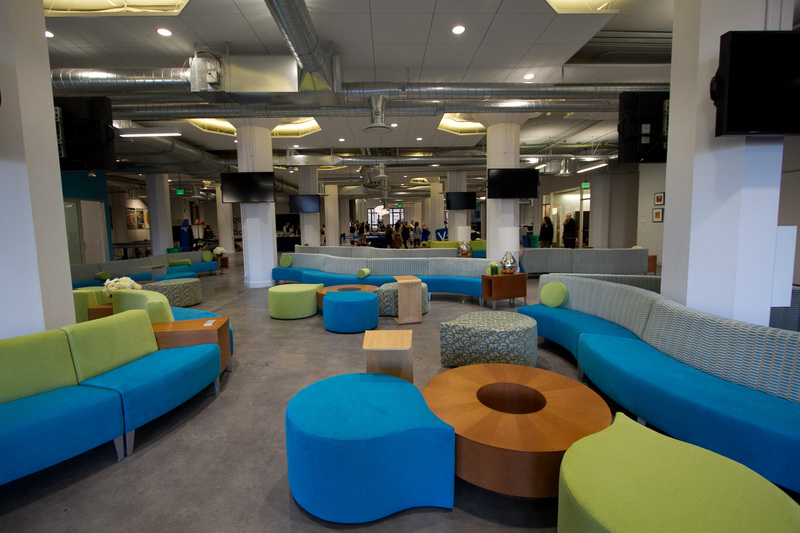 Yammer invited us to take a tour of its new offices and we found it to be large and spacious. We took a tour of the place at the same time the employees were arriving for work and many, if not all, were seeing it for the very first time. 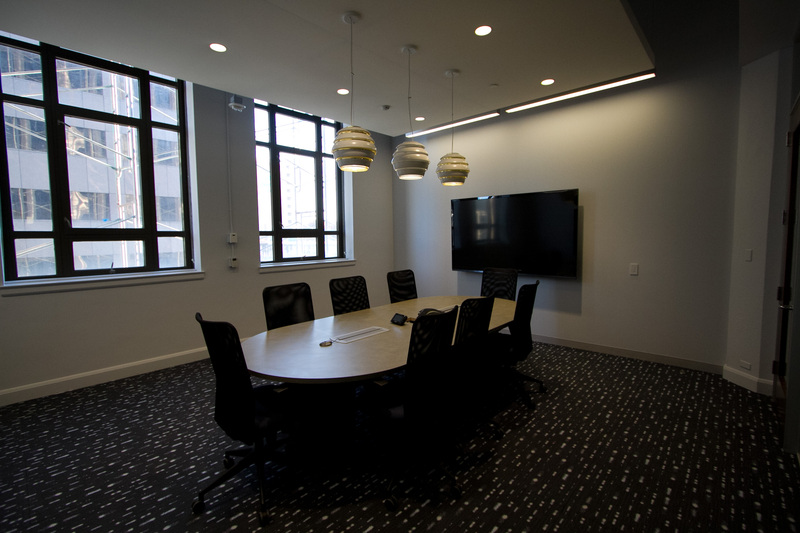 There are dozens of conference rooms of varying sizes and enough common space area for people to congregate and work. Yammer says that when it was looking for new space, it wanted to focus on those two things, in addition to making the office more transparent and all on one floor. While the San Francisco city government has passed tax incentives to keep companies in town, Yammer says that those tax credits did not motivate it to select its new office space — rather, it says it was an added bonus. Apparently, the company’s real estate/facilities team had been scouting for new offices over the past few years and had found its Market Street location quite appealing. This morning, both co-founders, Jason Rodrigues, Yammer’s controller, and San Francisco Board of Supervisor Jane Kim, took part in a ribbon-cutting ceremony to officially open up the office. 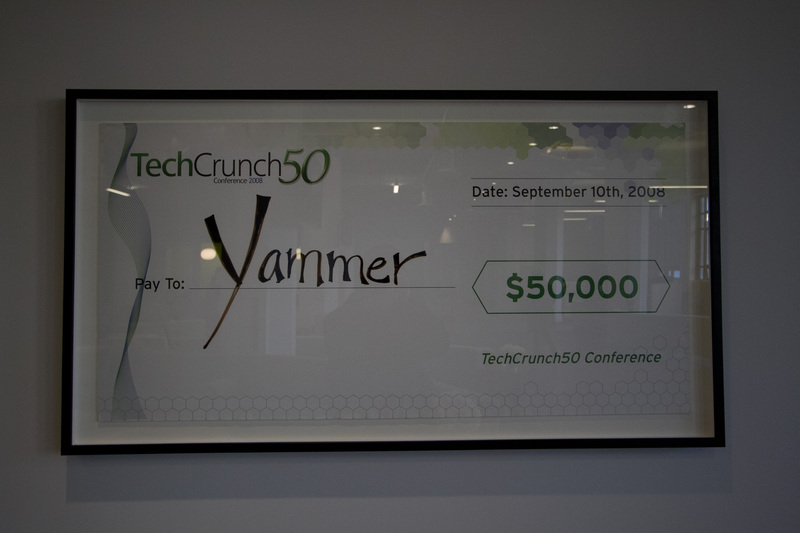 On a wall, Yammer has hung its TechCrunch50 award. Yammer’s desks span for as far as the eye can see. Yammer’s new office is filled with much more artwork compared to its previous one. It tells us that during a hack day, many of its employees created different art pieces to describe the company. Aesthetically-speaking, the workspace is quite fitting of the company. 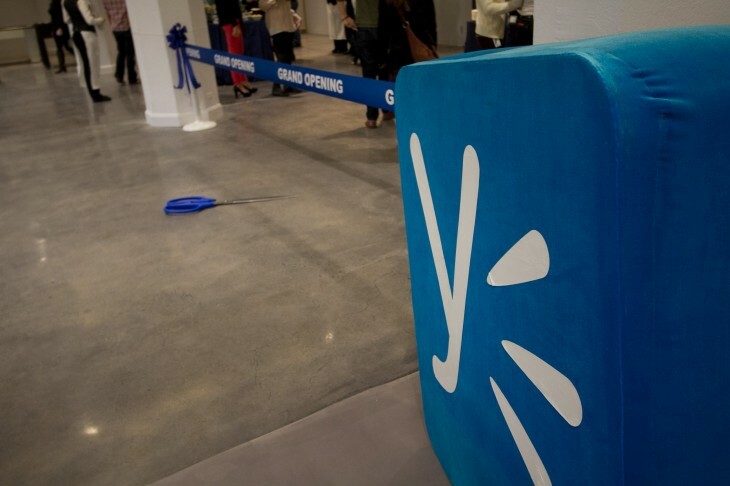 It’s very much adorned in Yammer blue and has the company’s personality in every detail. Yammer has provided top-of-the-line equipment to its employees in order to better do their jobs, including monitors in every conference room with cameras to conduct video conferencing, standing desks for everyone, and countless other services. The company is now a part of a historic part of San Francisco, taking shelter in a building that had been largely left unoccupied for the past 50 years.